Hey guys. Our old thread was removed from the forum... Maybe someone knows why? Never mind. Let's start a new one! I create a new screenwriting software named KIT Scenarist. My project is free and open source and currently it in an active development phase. Statistics - production reports and plots. If the project is interesting for you and you decide to try it, I'll be glad to hear your opinion about it. Maybe you have suggestions for improvement, or just want to express your opinion, then happy to hear you. We finally did automatic corrections for text in real-time! Less than three years, by the way! P.S. I'm talking about automatic text correction for dialogues and other blocks on the page breaks while writing the text. P.P.S. Respect to all developers of other scriptwriting software, who also developed this functionality. It was a real challenge! Last edited by dimkanovikov; 12-20-2017 at 10:40 AM. I enjoyed keeping up with your progress. Rude. Here's someone that didn't like what available and made his own. Then he makes it available for FREE on all platforms. When it comes to free screenwriting software, there's not a lot of good out there. Celtx get's the most attention, but it's so bloated and now it's online only. Trelby was promising but development has stopped years ago. Fountain can work, but it's too basic. So he realized there was a need, and he filled it. 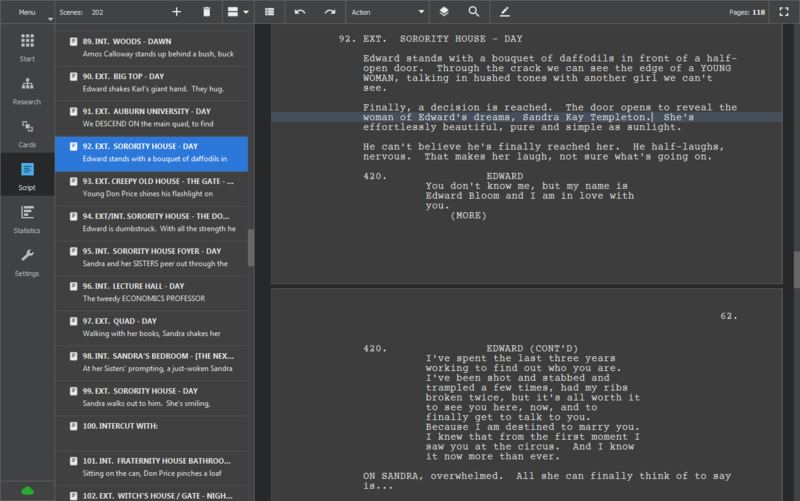 I think that KIT is the best free screenwriting software out there right now. I especially love the story development tools and still use them even if I'm writing a script in something paid like Fade In. @dimkanovikov: Don't let others get you down. Your software rocks! Come on, guys! Everybody has right to have own opinion. I don't aspire to universal love but simply do my job in pleasure. More apps - more opportunities to create a better stories! I noticed you've been gaining a little bit of traction with writers out there, so well done! Sometimes old promotion is removed, this one which was current was removed by mistake, so please carry on thanks! Thanks for the information, indietalk! Just installed your latest version on my Fedora laptop. Last one I installed was six months ago. I really like the new setup wizard you've implemented. Makes it much easier for us Americans to switch things over. Keep up the great work friend!